Original verses unveiling the “Elephants in the Room” and lamenting gun violence were intermingled with melodious tunes about Summertime and requests for strength. 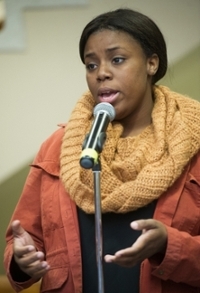 Several Southern Illinois University Edwardsville students displayed their conscience, minds and talents on Monday, Feb. 22 during the University’s Black Heritage Month’s History of Black Poetry and Music. Racism and privilege were addressed in Kenneth Coleman’s poem, “Elephants in the Room.” The junior theater performance major said he wants his work to challenge and inspire others. He also performed another one of his original works: “Black on Black Crime in a Modern Day Minstrel Show,” that criticized black artists and leaders for not using their power and influence to help with problems in the African American community. Another poetic appeal came from Naja Gbala. The freshman veterinary medicine major performed the piece, “No More,” which cries out against gun violence. “It’s out of control, and we need to change,” said Gbala, clad in a black T-shirt that read: “I Can’t Breathe,” which are words attributed to Eric Garner. Garner died in 2014 police custody in New York City after being put in what has been described as a chokehold. Gbala made reference to Garner and Michael Brown, who was shot to death by a Ferguson, Mo., police officer in 2014. Musical selections were also part of the program. “It’s important for people to know that a lot of music is rooted in African American music,” said Cinnamon Stewart, event coordinator and senior mass communications major, after belting out an impressive rendition of Ella Fitzgerald’s Summertime. 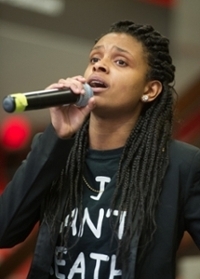 Stephanie Redfield, freshman mass communications major, gave a moving performance of I Look to You by Whitney Houston. Other participants included: Patrice Conner, a sophomore exercise science major; Michele Robinson, a junior psychology major and the SIUE Jazz Band. Singing Ella Fitzgerald’s Summertime is Cinnamon Stewart, event coordinator and senior mass communications major. The SIUE Jazz Band entertains during the History of Black Poetry and Music event.